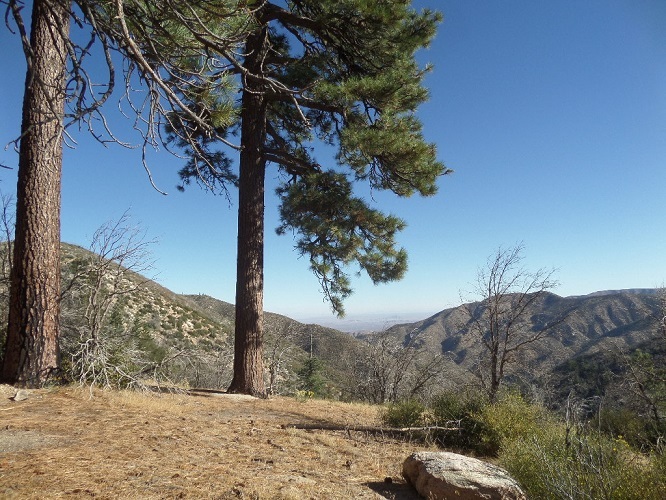 Camping/backpacking: Pacifico Mountain Campground is on the summit; there is an overlook about 3 miles from the trail head via the P.C.T. that would make a good camping spot as well. 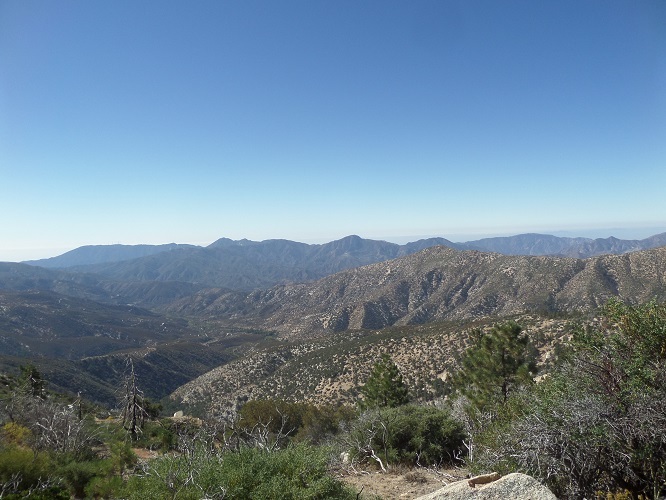 Pacifico Mountain (elevation 7,124) is the tallest of the northwestern San Gabriel Summits. Most hikers opt for the western route, from Mill Creek, but the summit can also be reached from the east, as described below. This route tends to attract fewer crowds. From the parking area, backtrack a short distance to the Pacific Crest Trail and head west. After a stiff initial climb, you settle into a gradual ascent through an area recovering from the Station Fire. 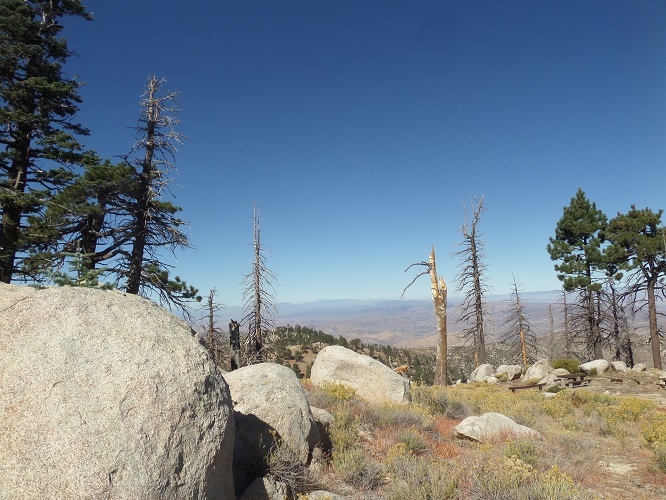 At 6,000 feet above sea level, the vegetation is varied, including yucca, black oaks and pines. Though some veteran hikers might find the first few miles of the trail a little tame, it goes by pretty quickly and the views to the south are impressive. 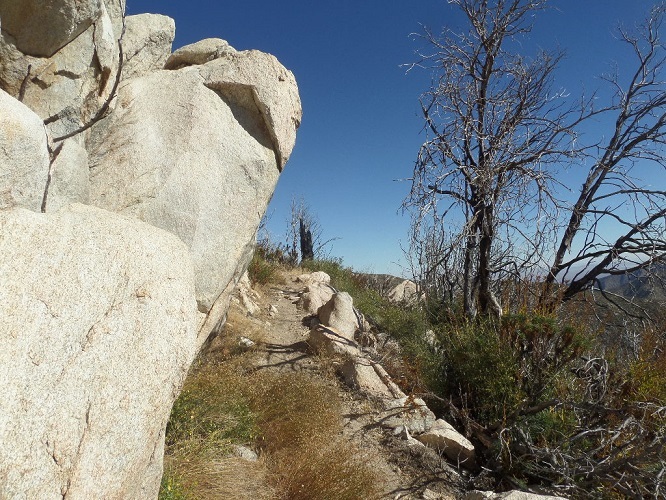 At about 2 miles, the trail skirts the north face of the ridge, providing views of the high desert. 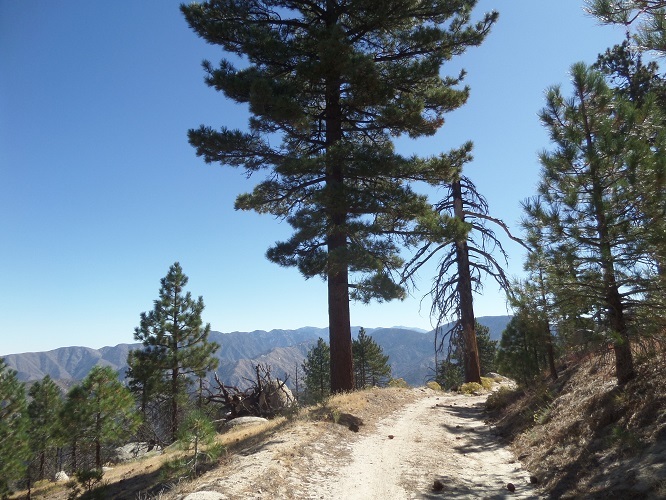 The trail then bends to the north, skirting the northeastern slopes of Pacifico Mountain. 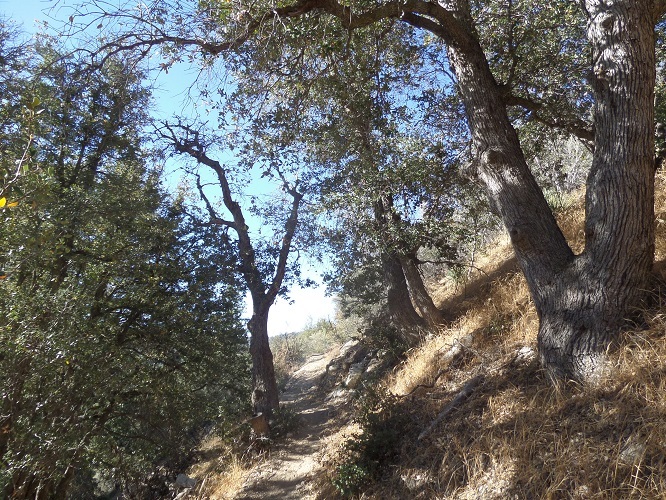 At 3 miles from the start, you pass an attractive, pine-shaded clearing with panoramic vistas; a good spot to catch your breath (or to camp if you are backpacking and are off to a late start). Continue north along the trail, watching for poodle dog bush, a plant that causes a poison oak-like itch. Poodle dog bush grows in high elevation areas that have recently been burned; these specimens were caused by the Station Fire. As of this writing, they are starting to die out (their life span is 5-10 years) but they are still to be avoided. Just over four miles from the start, the trial enters a grove of pines. As it makes a pronounced bend to the right (north), look for a gully heading southwest. This is the start of a cross-country route to the summit (it is also possible to reach the summit by continuing another mile or so on the P.C.T. and using road 3N17H). While the cross-country route doesn’t save much time due to its difficulty, it adds adventure to what has thus far been a straightforward hike. Follow the gully up to a ridge, climbing over boulders and fallen trees and avoiding poodle dog bush. At the ridge, head south where you will soon see the pyramid-like summit. You drop briefly to a saddle before making your final push to the top, forging whatever route you can. At the top you are greeted by the campground. While Pacifico Mountain is technically a drive-up destination, unlike Mt. Wilson, it receives far less traffic (it was empty when I was there, on a Sunday morning) and offers a 360-degree view if you walk around the entire summit. The true high point is a pair of rocks at the south end. If you are hesitant about climbing these rocks, you can still enjoy an outstanding view to the south, extending to Old Saddleback in Orange County and the ocean, if visibility is good. After enjoying the summit, you have a few options. You can return via the same route or you can descend the dirt access road (3N17H). While dirt roads usually aren’t prime hiking routes, this one offers some panoramic views to the south including Strawberry Peak and Mt. Wilson. 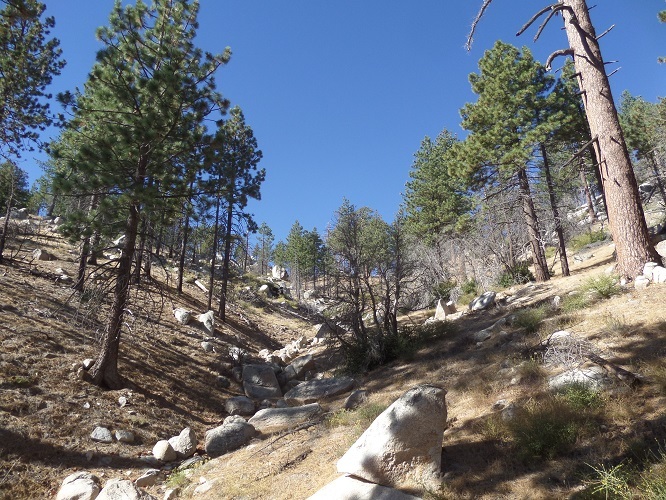 In a mile, it meets the Pacific Crest Trail, which you can follow for about 5 miles back to the starting point. Alternately, you can continue on 3N17H to a junction with 3N17. Turn left and follow 3N17 generally east for 3.2 miles, taking in views of the Alder Creek drainage below. When you meet the junction with 5N04 (the paved road on which you drove in), turn left and follow it 1.1 miles down hill back to the starting point. This last stretch, almost entirely shaded by pines and receiving light if any traffic, goes by quickly. Hi David – we did this yesterday and you described it perfectly. It was more pleasurable than it might seem for the reasons you mentioned – the gorgeous views and the off-path scramble. I didn’t tell my husband there was a campground at the top – so that was a surprise for him (and a family had taken a stroller more than a mile up that ‘road’ – I don’t know how anyone could drive it – perhaps more of a feat than ours). We took the option of the road to the PCT down – I think that’s a “long mile” from the PCT at the road back to the gully. We couldn’t figure out the mileage with all roads back – do you know the mileage from where the PCT meets the road to the next junction on the road? We figured it could be 7 miles of road, and so didn’t do it. But I’m sure the road-PCT option took much longer than if we had gone back down the gully. But we’re always in for new terrain. 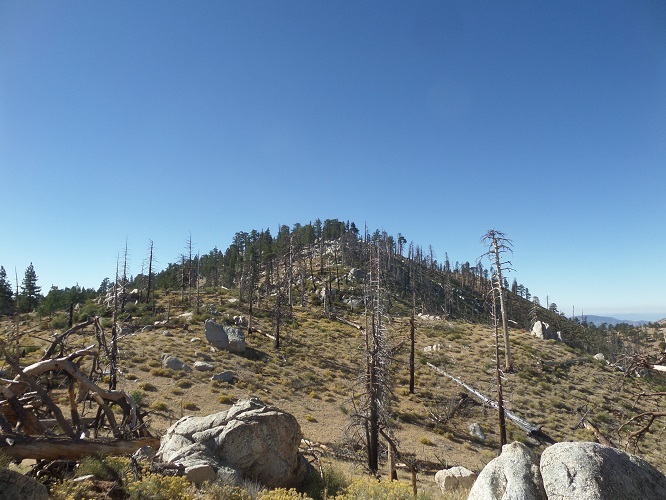 I also think the distance from what we called “windy gap” because it was so windy at the ridge (first views of desert) and the stand of evergreens is more like 1/2 mile. Thanks for the head’s up on poodle dog. Met quite a few hunters – it’s the last weekend of hunting season. One asked us “where did you hide the deer?” and described encounters with mamma bears and cubs. We also encountered our first through-hikers. And, on a day when LA was socked in with clouds and overcast, being above it all with long sight-lines was a plus. We never would have done this one without your description. BTW, we clocked our altitude at about 2000′ all-in. Glad to hear you enjoyed the hike. I’m not sure I follow your question about the distances from the PCT junction. If you’re referring to the distance on roads from the PCT back to the trail head, I think it’s about 6 miles. On the distances… you say it’s about 1 mile on the road from the top to the PCT junction. Then you say “Alternately, you can continue on 3N17H to a junction with 3N17. ” – that’s the missing mileage. Because you say once you reach the junction with 3N17, it’s 3.2 miles to the next junction and 1.1 miles from there back to the starting point. So that’s 5.3 miles total – but how far is it from the PCT junction on the road to 3N17H’ s junction with 3N17 – you’re probably right that it’s a mile at most, but I don’t know – so we didn’t do it. Oh – gotchya. If you’re descending 3N17H from the campground, it’s about half a mile from the “junction” with the P.C.T. to 3N17. From the summit to the trailhead, as per Google Maps, is 5.7 miles via the roads.